Can you hear them? Those sleigh bells are ringing in the distance. 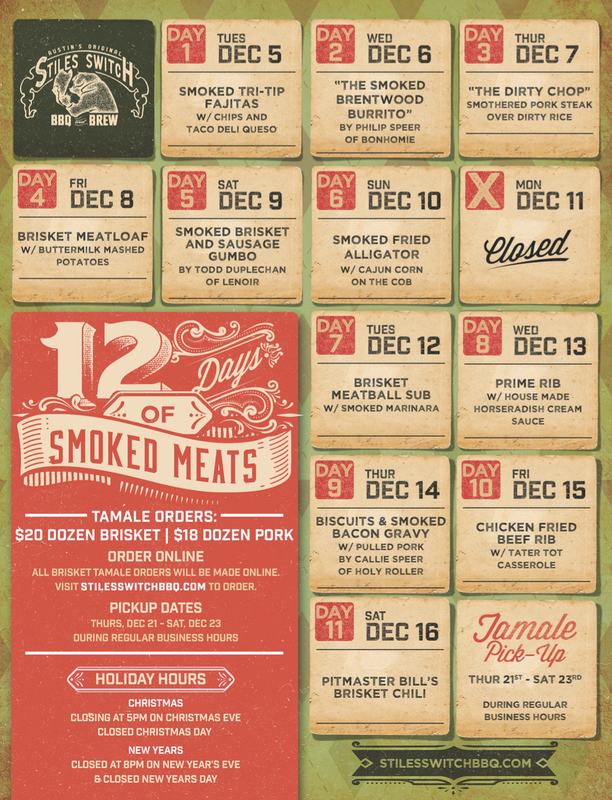 SAVE THE DATES and join us for the 2017 Annual 12 Days of Smoked Meats at Stiles Switch BBQ & Brew. Every year we look forward to bringing you new inventive and delicious bites for the annual Smoked Meat filled holiday fun. This year we'll be kicking things off on Tuesday, December 5th - Sunday, December 17th. DAY 12: TAMALE ORDERS - WE CONCLUDE THE 12 DAYS with our annual HOMEMADE HOLIDAY TAMALE PICKUP. ALL TAMALE ORDERS can be made starting NOW. TAMALE'S include: SMOKED BRISKET (by the dozen) or SMOKED PULLED PORK (by the dozen). PICKUP will be designated over three days - Thursday, December 21st thru Saturday, December 23rd during Regular Business Hours. All orders must be placed online. CLICK HERE TO PLACE YOUR TAMALE ORDERS! Stay tuned via our social media channels for special daily beer pairings and a few more surprises in store. Its going to be a Smoked Meat fun filled Holiday indeed! Ho! Ho! Ho!